Highlights of the New York Winter Jazzfest: Northwest names like Bill Frisell and Thomas Morgan; Mary Halvorson; The Westerlies, doing a piece by Wayne Horvitz; and Darcy James Argue’s band Secret Society. NEW YORK — With more than 100 performances in 12 downtown venues — many of which fill up early — the splendid gumbo of the Friday and Saturday (Jan. 6-7) marathons at Winter Jazzfest can be many different festivals to many different listeners. 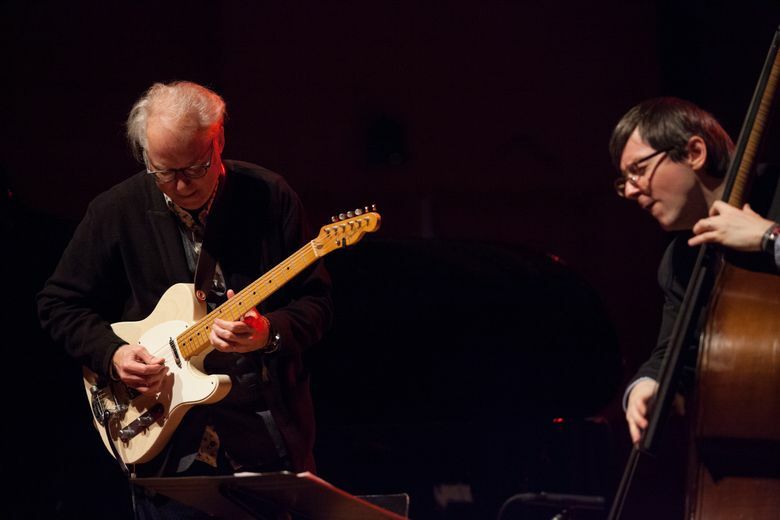 But surely one of the highlights this year was the elegant, intricate, soulful duo performance by Seattle guitarist Bill Frisell with bassist Thomas Morgan at the New School’s Tishman Auditorium on Saturday. Weaving through six tunes that ranged from the touching Willard Robison ballad “Old Folks” and Fats Domino’s lilting “What A Party” to “Subconscious-Lee,” Lee Konitz’s tricky take on “What Is This Thing Called Love,” the mischievous guitarist navigated ingenious paths through the songs’ harmonies, occasionally inserting a twangy jab or snow shower of quiet notes. In Morgan, Frisell appears to have found a naturally flowing conversationalist on the order of the late Charlie Haden, so it is welcome news that simpatico pair will release an album on ECM later this year. It was a good weekend for guitar. Saturday at the New School’s 5th Floor Theater, quirky Chicago six-stringer Mary Halvorson delivered a scintillating brace of compositions octet that cleverly translated her unusual intervallic sensibility to the sound of four horns and pedal steel guitar. Halvorson also shone as a slithery soloist when she kicked off the weekend marathon Friday at the same venue with fellow Chicagoan and cellist Tomeka Reid. The pair delighted the full house with speedy, angular unison lines. More Northwest-bred talent lit up Darcy James Argue’s riveting big band, Secret Society, at the basement club Subculture Friday, including tenor saxophonist Chris Speed, pianist Carmen Staaf, trombonist Ryan Keberle, drummer Jon Wikan and British Columbian trumpeter Ingrid Jensen. Argue’s explosive, rolling set, ominously peppered with tape recordings about politics, paranoia and conspiracy — per his brilliant and timely 2016 album, “Real Enemies” — was, along with the Frisell duo, one of the highlights of weekend. The marathons are just one component of the six-day-long Winter Jazzfest, which has become one of the most important annual showcases of new talent in jazz. It climaxes Tuesday with a performance by Charlie Haden’s Liberation Music Orchestra.